ing (MRI) (which is, in general, not necessary), the gland is diffusely enlarged and a small amount of fluid can be seen outlining the gland. Moreover, imaging is needed to rule out other underlying conditions that can be accompanied by hyperamylasemia, such as bowel obstruction, bowel infarction, gangrenous cholecystitis or perforated ulcers. In the progressive mild to moderate forms of AP the contour of the gland becomes shaggy. 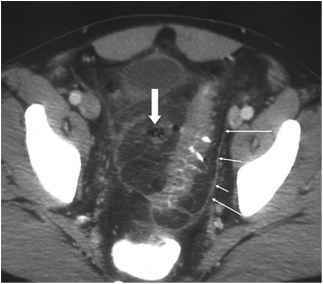 On CT and MRI, the appearance of the parenchyma may get heterogeneous and small intraglandular and/or retroperitoneal fluid collections adjacent to the organ may develop (Fig. 2). The severe forms of pancreatitis are determined by a delayed or no response to conservative therapy or even deterioration under therapy. The mortality rate at the latter stage is almost 100%. Typical findings in severe (necrotizing) AP are varying degrees of parenchymal necrosis accompanied by progressive exudation, superinfection of necrotic tissue, hemorrhage, abscess formation, phlegmon (~ inflammatory pannus), and vascular erosion (Fig. 3b). According to these pathomorphological conditions, the pancreas and its surroundings present a rather wide spectrum of imaging findings. In severe cases, US imaging is often compromised by overlying gas, peripancreat-ic exudation and phlegmoneous changes. After necrosis, the pancreatic appearance becomes increasingly hypoe-choic without differentiation of vital from necrotic tissue. Therefore, US is generally used for second line, complementary imaging in follow-up to detect fluid formations such as pseudocysts. Fig. 3. Acute severe pancreatitis. 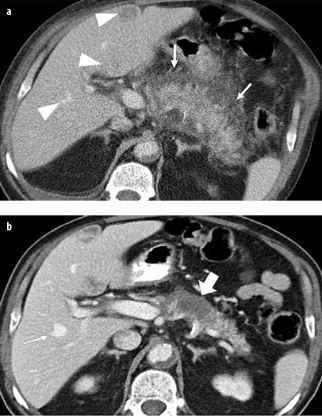 a At the patient's admission, contrast-enhanced CT during the venous phase displayed a fuzzy contour of the pancreatic gland together with peripancreatic exudation (arrow). Note the hypo- and hyperdense hepatic lesions (arrowheads). b A control scan 10 days later revealed an almost normal gland with resorption of the peripancreatic fluid. However, there was an area with a lack of enhancement representing focal necrosis (large arrow). In the liver, one lesion turned out to be a heman-gioma (arrow) while the other two lesions were small abscesses secting along retroperitoneal fascial planes into the mesocolon and the small bowel mesentery are frequently seen, as well as peripancreatic inflammatory tissue (phlegmon) and infected areas. In less than 10% of cases, small amounts of intraperitoneal fluid (ascites) are seen, whereas large volumes of intraperitoneal fluids are very rare. With respect to the literature, there is no significant superiority of MRI over CT in the diagnosis of AP and related complications. The superior tissue resolution and the higher sensitivity to slight edematous or necrotic changes, hemorrhage or fluid dissection of fat planes favor MRI. 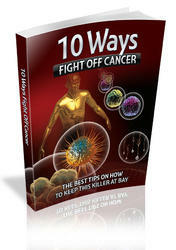 However, these advantages are often hampered by the impaired study conditions in severely ill patients that may degrade the image quality. 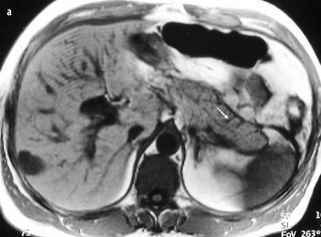 In severe AP, pancreatic flow can be reduced by iodinated contrast agents, which is followed by an increased rate of necrosis and mortality. This may make MRI the favorable staging tool in AP, however, this potential complication has never been proven for the non-ionic contrast agents that are used nowadays almost exclusively in CT [8-10]. The local inflammatory conditions are often complicated by regional and systemic involvement induced by autodigestion and activation of systemic inflammatory mediators [11-17]. WHAT IS PSEUDOFRAGMENTATION IN PANCREATITIS?